“No taxation without representation,” a slogan going back to colonial America, is commonly cited by overseas Americans like me in discussions of FATCA. It’s also the basis of the Tea Party’s name: a reference to the Boston Tea Party, an act of rebellion against the taxation of the American colonists by the British government. As I’ve posted before, we overseas Americans are, for all intents and purposes, not represented by anyone in the US government. Besides the double taxation, onerous privacy-violating requirements (the FBAR form) are imposed on us and not on our homeland fellow Americans. And we are threatened with extremely high fees if we do not comply by filing the required extensive forms, even if the forms only serve to prove we don’t owe any taxes. I find myself quoting this slogan “No taxation without representation” whenever I discuss why I renounced citizenship. It occurred to me the other day that this, in a way, allies me with the Tea Party, a group I strongly disagree with in pretty much every way. It’s an uncomfortable realization! In today’s Tea Party view, the current US government does not represent “We the People.” They believe the government is too big, that taxes are much too high, and that the government should be involved in the economy as little as possible. I don’t actually believe any of those things. I much prefer the Dutch system of higher taxes providing an adequate social safety net. 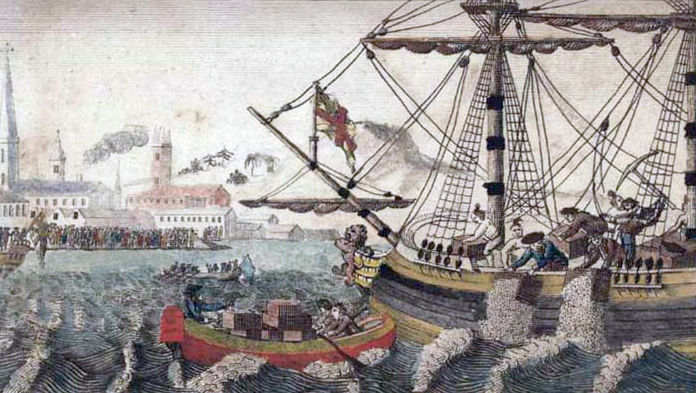 The original “Tea Party” took place in Boston in 1773, when colonists boarded a ship full of tea and threw the tea into Boston Harbor to protest a tax being charged on the tea. This act of rebellion increased tensions between the colonists and the British parliament, and can be seen as a turning point on the way to the American Revolution. Those colonists’ cry of “No taxation without representation!” is echoed by the current right-wing groups calling themselves the Tea Party. So where does that leave me? Am I suddenly a Tea Party sympathizer? Of course not. Today’s Tea Party is an amorphous group that has somehow laid claim to a proud tradition that belongs to all Americans. The rebellion of the colonists against the oppression of the British government is admirable, and I can protest the taxation without representation of overseas Americans without agreeing with the present-day Tea Party. By positioning themselves as born-again American patriots, the Tea Party implies that the rest of us, especially the left wing like me, are somehow not patriotic. The Tea Party started off with some good ideas but then they got hijacked by the loonies. The problem with a party promoting individualism is that its by definition hard to organise. Individualism can span the range from ‘no taxation without representation’ all the way to living in commune in Idaho prepping for the end of the world. In preparing this post, I tried to google them, but there seems to be several organizations calling themselves the Tea Party. It’s become a very wide variety of people, sometimes just united by a vague anti-government attitude. The modern Tea Party movement was started by libertarians, mainly Ron Paul supporters. But it was later hijacked by the mainstream Republicans. Or vice versa? They hijacked the mainstream Republicans? Yours is a particularly poignant position to be in and I can see that you are a patriot to the core! Interesting post – I’ve never lived outside of the US so I always find posts such as yours to be informative. Our son and daughter-in-law live in Washington, D.C. and as such they have to political representatives, i.e. senators, congress, etc. They pay taxes like all of us, but they have no representation. Go figure! That would make me angry too! Isn’t there any kind of movement to get them some representation? The difference between them and overseas Americans like me is that, while neither of us are represented, they don’t have to fill out that privacy-invasive FBAR form. Also, they at least get some services, contribute to supporting the military and schools and so forth, that, in theory at least, work to their benefit. Overseas Americans are expected to pay taxes when we receive absolutely no services from them. Congratulations on your decision to renounce US citizenship and thanks for your great blog. I renounced last year and, like those of my ancestors who rebelled against the Crown in 1776, am proud of having ended my “US personhood”. I served in the US Army for 3 years and returned to Europe a year after I finished my hitch. The percentage of renunciants who have served in the US Armed Forces is fairly high, since many of us met the right person somewhere along the line and saw no reason to go back to the US. After 40 years here in Europe, I know I made the right decision back in (19)76. And I’m sure you can say the same about your decision to stay in The Netherlands. Good luck to you Rachel and keep sharing your great insights with all of us. Thanks for your kind words, David! Isn’t it a shame, though, especially regarding veterans, of all people, that you have to choose at all. Americans talk a lot about honoring their veterans, but it seems to only apply if you stay in the US. Thanks for your reply Rachel. I agree with what you said about veterans. As one of my fellow veterans (now in the UK) noted, the USG sent us overseas only to attack us for staying decades later. But like yourself, I was fortunate enough to land in a country with a social network. So, whenever I see pictures of or hear about homeless US veterans, I feel very fortunate indeed to have landed here in Germany. I only wish that every expat who has to renounce will end up as well off as the two of us. Keep up your good work, Rachel! People like you are much appreciated by millions of less prominent US expats who are desperately trying to find their bearings. I find myself growing increasingly disgusted by certain people who are attempting to hijack what America used to stand for and turning it into their own form of convoluted craziness. Americans are signing away their right to privacy in an attempt to increase their safety but are steadily losing ground in that area as the growing violence demonstrates. The idea that any citizen who chooses to live outside the US is less loyal and more suspect (of what?) is very disturbing to me. You’ve brought up some interesting points that we, as new bank account holders in Portugal, will have to investigate further. I’m sure that the Isaac Brock people would also be interested in how it goes for you as people who recently moved overseas. Did they give you any trouble in Portugal about opening a bank account? I would be angry too if I were an American expat. Glad to hear your distinction about the differences between renouncing citizenship and the Tea Party politics. America is in a sorry state politically today but for most the freedoms we enjoy are worth a party (but just without the tea-associations. )All the best. A big difference is that you really were being taxed without representation. Seems to me that too many Americans only feel that way when their party doesn’t win the election. Good point! Americans have relatively low tax rates compared to here in Europe, yet complain about high taxes far more! And at the same time have quite low voter participation rates! It must have been very hard emotionally to renounce your citizenship when you are a patriotic American but I suspect I might have come to the same conclusion over time. Ridiculous that we treat people this way. While Tax Treaties alleviate double taxation, some forms of double taxation are guaranteed through tax treaty gaps. Outside of the FEIE on earned income, any tax the US has but not your country of residence, any higher US tax rate, or US tax by a different name flows through as double taxation. Compliance cost is also a tax related cost and this is definitely doubled up and substantially more expensive to wade through the overlay of the 74,000+ page US tax code on top of the tax code of your country of residence, as if you still live in the US (which penalizes “foreign” accounts and assets). All for no services in exchange. Exactly. I haven’t read the IGA to see whether my pension would be double-taxed here in NL. Renouncing means I won’t have to figure that out. But I know that in some countries people have retired and then found out that their pension earned outside the US is considered UNearned income by the IRS, which means it doesn’t fall under the $100,000 or so exemption we get on earned income. The thing is, they’ve already paid taxes on it as it went into their pension account (in some countries) or they get taxed as they withdraw it as a pension, but at a low rate. Either way, it ends up double-taxed. Completely unfair, and for some pensioners, it’s disastrous. I’ve heard a lot of Americans make comments like that lately, but leaving America means dealing with FATCA, FBAR, etc, so do your financial planning first, if you ever decide to leave! The disconnect between thought and reality here is absolutely astounding. People complain about Republicans and the Tea Party. Yet, who was responsible for enacting FATCA? Four liberal democrats, i.e., those who believe in big government and maximum taxation. I have no sympathy for those who vote for a social welfare state and who then flee from the results of their own voting behavior (leaving the rest of us to deal with the fallout). I plan to leave the U.S. within the next two years, because it has become a socialist welfare state where neither property nor freedom is secure. When Republicans are in power they simply slow down the slow slide towards tyranny. They seldom repeal pernicious laws enacted by the Democrats, such as FATCA, so I see very little hope for the future. Well, I agree with that last point, but not much of the rest of what you wrote. Yes, FATCA was passed by Democrats, and yes, it is unlikely to be changed. However, the people who are victimized by it for the most part do not vote, as they live overseas, and even of those who did vote, I would suspect that more or less half voted Democrat and half voted Republican. So saying we’re fleeing from our own voting behavior is classic “blame the victim.” I moved overseas to live in the Netherlands with my Dutch husband. This was long before FATCA was passed. So how is this all my fault? Given your political views, I’d be very curious to know where you’re planning to live once you leave the US. Interesting. To answer your question, many of the overseas “Americans” are the “accidental Americans” I’ve written about, i.e. they were born in the US but moved as children to their home country. Many don’t know, or didn’t know until recently, that they’re American citizens and are supposed to file tax forms in the US. Growing up as, for example, a Canadian, it would never have occurred to them to vote in the US. In addition, if you’ve never voted in the US, you’re not registered anywhere, and I’ve heard it’s a bit of a bureaucratic nightmare to get registered anywhere. Many of them don’t even have a social security number. Another large group of overseas Americans have lived overseas for so long that they’ve integrated into their adopted country, become citizens often, etc. The longer you live in another country, the less you keep up with politics in the US enough to feel competent to vote. So saying “In a democracy people get the government they deserve” is, in this case again, blaming the victim. I would agree with it when you’re talking about temporary expats, i.e. the ones who go live in another country for a few years for their job, but have every intention of going back and consider America their home. But the rest of us are not in that category. We don’t live there, so it’s not our government anymore, yet it’s legislating in a way that particularly victimizes us. I was not taking about such people. I completely understand their plight. I was talking about the failed duty of all the Americans who live offshore and either do not vote or vote for a social welfare state. A social welfare state ALWAYS leads to increased control of the population and the increased need for revenue to feed ever-growing social welfare programs, which is why FATCA was enacted (to obtain a new revenue stream by exercising extra-territorial jurisdiction). Those people have no one to blame but themselves. The true victims are the accidental Americans that you mentioned and those who do vote for small government (like the Tea Party people) who must live with the results of the actions of others. Those are exactly the people who are NOT impacted by FATCA, because they are returning to the U.S. Whether or not they vote is irrelevant. In fact, because about half of them will vote for the politicians who enacted FATCA you do NOT want them to vote. It is victimizing you because there is no political price to pay, because you are not organized and do not vote. If just ten percent of the people actually impacted by FATCA donated just $10 per year to a single-issue political organization it would result in a $10 million political war chest. This could have resulted, for example, in Rand Paul as a nominee for President (who has offered legislation to repeal FATCA, as well as a lawsuit challenging it). I guess that you are looking at the past while I am looking at the future. FATCA is just the tip of the iceberg. These types of abuses will continue while voters continue to vote for a social welfare state. The future of liberty is now in those nations that have already lived through socialism, felt its sting, and evolved into capitalistic Constitutional Republics. The other blessing is that the large welfare states will eventually collapse under the weight of their own unsustainable debt. It is unfortunate that these failed zombie states will impose untold misery until they collapse. As I’m sure you expect, I disagree with you, mostly because you blame it all on supporting what you call social welfare states. I do support a social welfare state: the Netherlands is a good example, and the Scandinavian countries are even better examples, of social welfare states that work. You predict they will eventually fail, and I have no guarantee that they won’t, but I disagree that supporting such a system is to blame for the government’s bad decisions, including FATCA. I would never, for example, have voted for Rand Paul. I agreed with him on FATCA, but not much else. The overseas Americans who do follow US politics have been very divided all along about who to support, and I can’t see that changing. They have, on the other hand, been able to raise money for lawsuits related to FATCA. I have more faith in that succeeding than in any political change.